Basements do not have to be dull, boring, and cold. You can make your underground space look attractive and beautiful, even if you do not have a huge budget to remodel your basement. All you need is a few ideas and some time to convert your basement from a storage area into a space where everyone will love to spend time. It is surprising how as simple a thing as changing the color of a space can completely transform its look. Painting any exposed beams in your basement will give it a finished look. Similarly, you can paint the concrete floor with a bright color and design murals on one or two walls to spruce up the boring interior. Brighten up a dark basement with different types of lighting. Use lamps, chandeliers, string lights, and lanterns to bring light as well as life to your basement. Using an area rug is a great way to add color and warmth to a dull and cold space. Depending on the size and design of your basement, you can use one large or many small area rugs to define the functional areas or to simply cozy up your house basement. Is your basement just a big hall and you don’t have the budget to hire a contractor for remodeling it into a proper living space with multiple rooms? Don’t worry! Using curtains is an inexpensive way to add dimension to your basement as well as to divide it into different functional areas, like a living room, a gym, a play area, or even a small bedroom. Use colors and prints that make the space look open and appealing. Have an unfinished ceiling? Soften it up with fabric. Hang swaths of your choice of fabric to create a canopy ceiling. Use a soft fabric to create beautiful drapes that will add luxurious touch to your basement. Make the walls of your basement a little more exciting with a huge painting. Opt for a piece that has vibrant colors so it stands out. 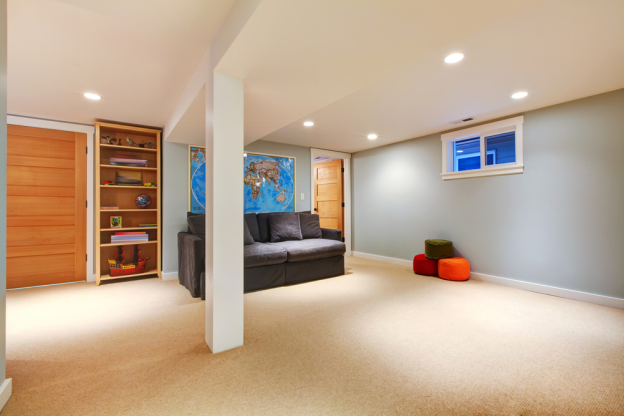 Here you go – use these simple basement finishing ideas to bring your dull and cold underground space to life. For more ideas or help, get in touch with Utah Basement Finishing– the most reliable company for basement finishing in Salt Lake City, UT. Basements do not have to be dull, boring, and cold. You can make your underground space look attractive and beautiful, even if you do not have a huge budget to remodel your basement. The article gives some simple ideas to convert your basement from a storage area into a space where everyone will love to spend time, without spending huge bucks. Use our form to estimate the initial cost of basement finishing. How Much Does It Cost to Finish a Basement in Utah? How Do I Waterproof My Basement In Utah? Will a finished basement add value to my home?